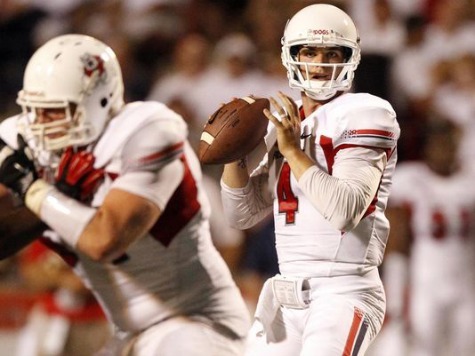 Derek Carr excelled at pass-happy Fresno State. Can the fourth pick of the second round of the NFL draft succeed a hundred and fifty miles northwest in quarterback-cursed Oakland? The Oakland Raiders have named Carr as their starting quarterback. In a draft class that included Blake Bortles, Johnny Manziel, and Teddy Bridgewater, Carr has emerged as the lone pick to be named a starter. The Silver and Black open the season at MetLife Stadium against the New York Jets on Sunday. The franchise that has fielded futility at the quarterback position for more than a decade hopes that Carr proves less a Josh McCown or JaMarcus Russell, and more a Jim Plunkett or Ken Stabler. Carr beat out veteran quarterback Matt Schaub, who was widely expected to assume duties as Oakland’s signal caller after a miserable, injury-shortened final season in Houston. The brother of David Carr, Schaub’s predecessor in Houston, made his case in the preseason finale against the defending Super Bowl champions by completing 11 of 13 passes–three of them touchdowns–for 143 yards. Carr plays as the 18th quarterback for the Raiders since Rich Gannon went down to injury in 2003.